Do you run a small business and want to start hiring remote employees? Giving people the freedom to “work from home” can be beneficial to the success of your company. Plus, the hiring process can be simple if you take advantage of WPForms, a powerful form builder that seeks to give companies an easy way to operate their businesses. 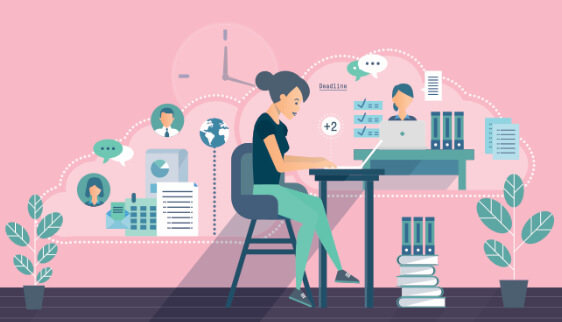 In this article, we’ll take a look at the top 4 benefits of hiring remote employees and show you how WPForms can help you collect job applications online so you can choose the best candidate for the position. 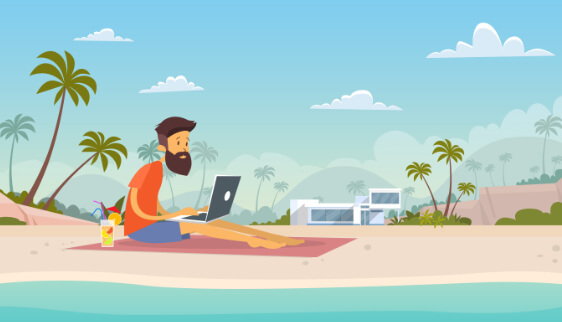 Remote work refers to work that is done outside of the office. It is sometimes called telecommuting, teleworking, or plain old “working from home” (or anywhere else for that matter). There are different kinds of remote work. For example, some companies that hire remote workers only allow people to work away from the office a few days a week. On the other hand, some companies allow their employees to work away from the office as much as they want to. Office-Based. The whole team works in one or more offices. This is a traditional work setup. There is no working away from the office. Office-Based with Work From Home Option. The whole team works from one or more physical offices, but employees can work away from the office a few days a week. Local Remote Team. Whether there is a physical office or not, local employees don’t have to work there. Instead, they can work away from the office all the time. Worldwide Remote Team. Unlike a local remote team, this setup has remote workers spread across many time zones. Nomadic Remote Team. This term refers to worldwide remote teams with employees that regularly travel around the world. Here at WPForms, we employ the worldwide remote work setup. We have employees that are nearby each other in a local sense, but also employees that live in different time zones. And it’s working for us! Now let’s take a look at the benefits of hiring remote employees, regardless of which setup you choose. We are more connected than ever thanks to advancements in technology. With cloud computing, laptops, smartphones, wearable technology, and good old WiFi, people all over the world can easily stay connected and communicate their needs. When teams need to come together and meet, they can email, instant message, and even attend meetings via video chat. And when it comes to needing to share project notes, updates, and paperwork, file sharing over platforms such as Slack and Asana work just fine. It may not make sense at first, but if you think about it, it’s true. When you get to choose where you work, you have the potential to be much more productive. A study performed by Harvard Business Review confirmed that letting employees work from home actually boosted productivity. And they claimed that one of the biggest reasons for this was less distractions. And of course, there was no commute to and from work each day, which is a nice change for any person that has driven to work in rush hour traffic before. Adding to this, hiring remote employees and letting them choose their own work hours means they are able to work at the time of day they feel most productive. For example, some people love to get up at 4am and start their day. Others don’t start until late at night. Being able to work outside of normal business hours by choice is one of best ways to get more done. It should come as no surprise that not having an office full of staff is a cost-effective move. You won’t have to pay for things like office space, furniture, office supplies, janitorial services, technology and equipment, or even utilities such as water and electricity. Instead, your employees enjoy the comfort of their own home, or wherever they like to work, and others pay for those things. 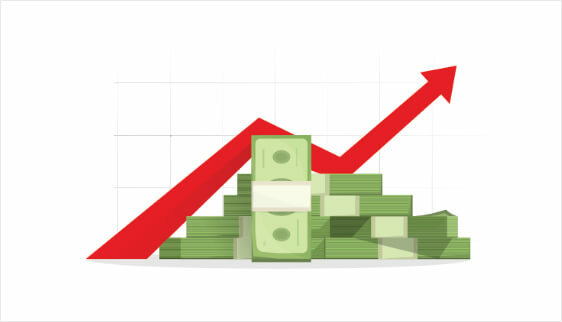 In that same study above by Harvard Business Review, experts found that over a 9-month period with remote employees, there was a savings of over $1,900 per employee in just office space and furniture costs. That’s a lot of money and a really good reason to consider hiring remote employees to work for you. And don’t think that it’s only you that will save money by having remote workers. Those that don’t have to come into an office everyday save money too on the commute. Gas, car insurance premiums, wear and tear, and more all add up when someone has to drive to and from work five or more days a week. Speaking of saving money. We all know that high employee turnover rates can wreak havoc on a small business’ bottom line. Going through the hiring process, training new people, and even buying needed supplies can cost a business a lot of money. That said, 95% of companies that hire remote workers claim that in doing so, their employee retention rates have stayed high. Part of the reason for this is that when you open your business up to hiring remote employees, you have more candidates to choose from for the job. If you can choose from people all over the world applying to fill a position, you’re more likely to tap into the top talent. Those that are good at what they do, appreciate being able to work remotely, and want to work for you are the best for low turnover rates. As you can see, giving people an alternative to working 9-5 in a physical office can work wonders for them, and your small business. So, you’ve decided that you want to hire people to work for you remotely, but you aren’t sure where to start. That’s okay! We’ve got you covered. WPForms is the most beginner friendly and powerful to use WordPress form builder in the market. It helps small business owners achieve their goals in a simple way by giving them the tools needed to create stunning forms that convert. One of the best things about WPForms is that is provides users access to over 100 pre-made form templates designed to help people get started creating any type of form they can imagine with the Form Templates Pack addon. And it just so happens that there are two perfect templates you can add to your company’s website to help you attract high-quality candidates looking for a remote job. The first is the simple job application form template. With it, you can easily collect contact information from potential candidates, find out which position they’re applying for, find out about referrals and start dates, and even let them upload their resume using the file upload feature. After creating your job application form, all you have to do is add it to your WordPress website in a post, page, or even widget area for people to fill out. And if you want to keep your job application form open for a specified amount of time, look into enabling WordPress form scheduling so that when time runs out, no one else will be able to apply for the job. 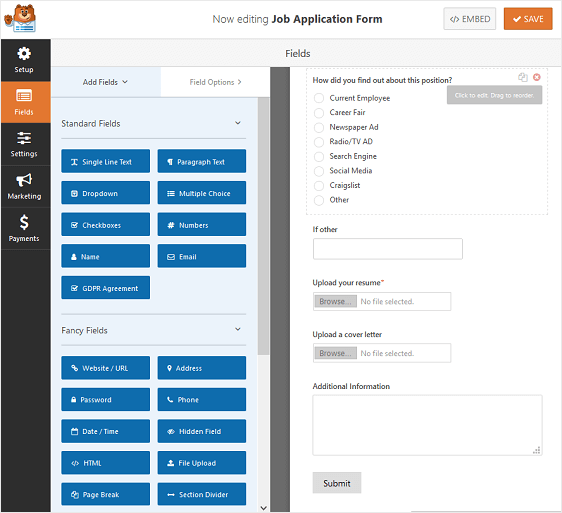 For help with this, be sure to check out our step by step tutorial on how to create a job application form in WordPress. Another way you can hire remote workers for your company is to enlist the help of remote employees you already know and love by creating an employee referral program. Reward current employees that help you hire the best talent out there, and make the hiring process easier on yourself too. 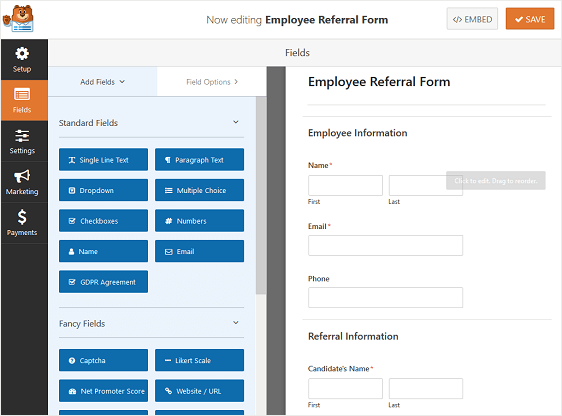 With WPForms’ employee referral form template, you can create a form for employees to fill out when they find someone they know would be a perfect fit for a job opening in your business. Get the employee’s information and why they’re recommending this candidate for the job. In addition, get the referral’s contact information so you can reach out to them and set up an interview. Referral hires, whether working remotely or not, tend to be some of the best candidates because internal employees that already know and understand the way your business work have a good eye when it comes to knowing whether their friend will be a good fit or not. So, just as you would the job application form, add your employee referral form to your company’s website and let people fill it out when they find someone they like. And if you want to make sure only employees can fill out and submit your employee referral form, use WPForms’ Form Locker addon to password protect the form. This way, only those that have the password will be able to submit the form. Or, you can restrict access to your form to logged in users so only your employees have access to the form. For help with setting up an employee referral program, check out our tutorial on creating an employee referral form to get started. And there you have it! You now know the benefits behind hiring remote employees, and how WPForms can help you. To make sure that everyone on your team in charge of hiring, yourself, and your remote job candidates receive an email after a job application or employee referral form has been processed, make sure to look into how to create multiple form confirmations in WordPress. If you’re still not sure whether WPForms is the very best WordPress form builder around, make sure to see what our happy customers have to say.